Logic Board for Apple iPad 2nd Generation 16gb A1395 Fully working, no iCould lock. 1 Motherboard. only compatible with: 1st Gen iPad 2 Wi-Fi. We are here to help! Logic Board for Apple iPad 2nd Generation 16gb. Fully working, no iCould lock. IPad 2 WiFi Logic Board IC Card Connector BCM43291HKUBC for Motherboard Repair . This wifi board repairs all Wi-Fi issues that are not related to the wifi flex cable! It does not required soldering. Good working, no iCloud lock. Logic board for Apple iPad 2nd Generation 16GB A1395, Fully working, No iCloud lock and is factory unlocked. 32gb, A1397. Logic Board for Apple iPad 2nd Gen WiFi 3G Verizon. Clean ESN, no iCloud lock. Part Number: A1395 EMC 2560 | MC979LL/A | iPad2,1/iPad2,4. Compatible: Apple iPad 2 | A1395 EMC 2560/2415 |MC979LL/A | iPad2,1/iPad2,4. Part Info: Apple iPad 2 WiFi 16GB Logic Board. Internal SKU# B3683. Apple iPad 2nd Gen GSM A1396 GSM/AT&T Logic Board 16GB Used. Condition is Used. Shipped with USPS Priority Mail. This is brand new Apple iPad 2nd Gen Cellular A1397 CDMA/Verizon Logic Board 32GB. This unit has been thoroughly inspected and tested by our in-house, factory-trained technicians. As a result of the technicians' professional handling and care, the unit has been returned to factory specifications. You can expect a fully-functional unit. . The serial number on this board is DMPJ633LDFHW, with version 9.3.5(13G36). This is brand new Apple iPad 2 Wi-Fi A1395 EMC 2415 Logic Board 32GB Used. Please refer to the pictures. This unit has been thoroughly inspected and tested by our in-house, factory-trained technicians. As a result of the technicians' professional handling and care, the unit has been returned to factory specifications. You can expect a fully-functional unit. . This is brand new Apple iPad 2nd Gen GSM A1396 GSM/AT&T Logic Board 16GB Used. This unit has been thoroughly inspected and tested by our in-house, factory-trained technicians. As a result of the technicians' professional handling and care, the unit has been returned to factory specifications. You can expect a fully-functional unit. . This is an original part for Apple iPad 2, 16GB WIFI A1395, serial number DN6G8ZJYDFHW, version 9.2(13C75), model MC769LL/A. 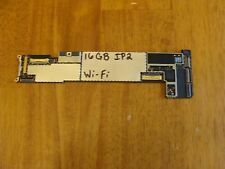 Logic Board for iPad 2 A1395 16GB Wi-Fi - 639-1180 EMC-2415 w/Headphone Jack. Condition: Used. This is brand new Apple iPad 2 Wi-Fi A1395 EMC 2415 Logic Board 16GB Used. Please refer to the pictures. This unit has been thoroughly inspected and tested by our in-house, factory-trained technicians. As a result of the technicians' professional handling and care, the unit has been returned to factory specifications. You can expect a fully-functional unit. . This is an GENUINE APPLE PART. Just add the LCD and Digitizer and you have a working unit. There may be a slight ding or dent in one of the corners. This is the 32GB logic board for the AT&T iPad 2 3G model. Part Number(s): 821-1866-C.
Logic Boards. The Apple iPad 2 Tablet Logic Board 16GB 820-3069-A has been graded A. This item is 100% functional, and in very good condition. Cell Phone Batteries. AC Adapters & Power Supplies. DC and Power Jacks. Logic Boards. The Apple iPad 2 Tablet Logic Board 32GB 820-3069-A has been graded A. This item is 100% functional, and in very good condition. Cell Phone Batteries. AC Adapters & Power Supplies. DC and Power Jacks. Logic Boards. This Apple iPad 2 64GB Logic Board 820-3069-A is tested working. Cell Phone Batteries. AC Adapters & Power Supplies. DC and Power Jacks. Card Readers. Power Button Covers. Other Parts. (No SIM card is required. Logic Board is setup for new Verizon account. See photograph #8. Logic BoardIS NOT connected to an iCloud account. 1)have never removed / installed a Logic Board or Motherboard from / into a tablet or PC. Logic Boards. This Apple iPad 2 32GB Logic Board 604-2199-31 is tested working. Cell Phone Batteries. AC Adapters & Power Supplies. DC and Power Jacks. Card Readers. Power Button Covers. Other Parts. Logic Boards. The Apple iPad 2 Tablet Logic Board 64GB 820-3069-A has been graded A. This item is 100% functional, and in very good condition. Cell Phone Batteries. AC Adapters & Power Supplies. DC and Power Jacks. Pulled from working iPad 2. Great condition, everything works, clean IMEI, NO iCloud lock. No water damage, no physical damage. This is a 64GB iPad 2 logic board. Wifi plus 3G. Original carrier is ATT. Logic Boards. The Apple iPad 2 16GB Logic Board 820-3069-A has been graded A. This item is 100% functional, and in very good condition. Cell Phone Batteries. AC Adapters & Power Supplies. DC and Power Jacks. Logic Boards. The Apple iPad 2 Tablet Logic Board 16GB 820-3204-A has been graded A. This item is 100% functional, and in very good condition. Cell Phone Batteries. AC Adapters & Power Supplies. DC and Power Jacks. This is the Logic Board for the iPad 2 16GB Wi-Fi model. This is a pull from a working unit and is fully functional. Part Number(s): 639-1180. 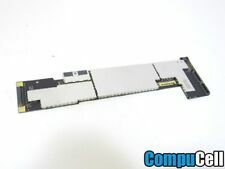 This is the 64GB logic board for the iPad 2 AT&T model. Condition: Item is fully tested and operational. Item shows minimal signs of wear from previous use: light scratches and/or light scuff. Also, we do not have a price matching policy. We will not price match to a lower price. 1 x LCD Screen FPC Connector. This is our SOP, for us to be certain and for record purposes. - For Apple iPad 3 A1416, iPad 3rd Gen (Wi-Fi Only). - For Apple iPad 3 A1430, iPad 3rd Gen (Wi-Fi/Cellular AT&T). For Apple iPad 2. Make sure this before you disassemble your Phone. Logic board for Apple iPad 2nd Generation WiFi 3G GSM 64GB, Fully working, No iCloud lock and is factory unlocked. Logic board for Apple iPad 2nd Generation 32GB WiFi 3G Verizon Unlocked A1397, Fully working, No iCloud lock and is factory unlocked. IPad 2 A1396. iPad 2 A1397. iPad 2 A1395. Connects the WiFi / Bluetooth connector to the logic board. 1 - WiFi / Bluetooth to Logic Board Connector (30 Pin). Power Adapters and Cords. iPad2,1 Early 2011: MC769LL/A (1.0 GHz Apple A5).